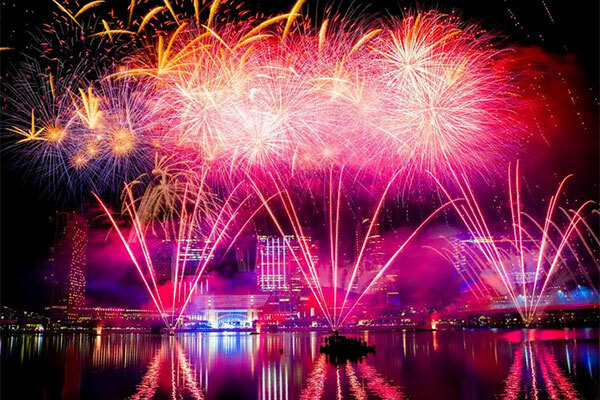 Abu Dhabi's Al Maryah Island has partnered with Platinum Records, a leading record label company which operates under the MBC Group umbrella, to usher in 2019 with a star-studded music and fireworks spectacular. As the capital’s biggest New Year’s Eve celebration, visitors will be entertained on Al Maryah Island’s promenade with live performances by Amr Diab and Myriam Fares. Award-winning singer and ‘Father of Mediterranean Music’, Amr Diab will mesmerize the audience with his highly-popular and smash-hit songs, spanning over three decades. The seven-time winner of the Best Male Arab Artist at the World Music Awards, and Guinness World Record breaker, Amr Diab, will be performing his greatest hits such as Habibi Ya Noor Alain, and tracks from his latest album. Kicking off the New Year’s Eve celebrations, Myriam Fares will entertain audiences with her hits such as Chouf Halak Alayi, Ana Gheir, and Kifak Enta. Fares’ career spans over 15 years and has been voted by Google as the Middle East’s Most Searched Online artist and recognized as the Number One Youth Artist of the Arab World. Fans are guaranteed a night of spectacular shows against the stunning backdrop of the sea. Nadine Saleh Hassan, head of Communication of the Alternative Investments & Infrastructure platform at Mubadala Investment Company, said: “We look forward to welcoming residents and visitors alike to Al Maryah Island’s new year’s eve celebrations. We have established Al Maryah Island as a key destination for events throughout the year and are excited to close 2018 with a major performance, a memorable fireworks show and experience for all our guests. More than 12,000 people are expected to attend the music concerts, which will include a thrilling midnight countdown and a spectacular fireworks display. The event runs from 7:00 pm – 1:00am and is free to attend. Entry to the main concert is on a first-come, first-served basis and open to all visitors. Prime spots will fill up quickly and guests are encouraged to arrive early. However, everyone is guaranteed a fantastic view thanks to large floating screens out on the water, ensuring no one misses a second of this electrifying evening. The celebrations will spread across the island this New Year’s Eve, with some of the most exciting events in the capital being hosted by Al Maryah Island’s two stunning hotels, and luxurious shopping and dining destination, The Galleria. Guests can also delight in indulging in New Year’s Eve staycations or vacations at the Rosewood Abu Dhabi and Four Seasons Hotel Abu Dhabi at Al Maryah Island, which are each offering their own exciting New Year’s Eve and New Year’s Day programs, bursting with fun packages for families and friends. Dine and party your way through from the Festive and into 2019 at Four Seasons Abu Dhabi at Al Maryah Island. Cafe Milano offers a stunning range of dining options from a stylish Christmas Eve set menu, to the best seats in the house for New Year's Eve fireworks from the terrace, with their own live entertainment to match. Eclipse Terrace Lounge will party into the New Year from an elegant rooftop location. And of course, there is Crust – with a special New Year’s Eve brunch, with Al Meylason the lobby level serving a more relaxed dinner package. Witness the most exciting Al Maryah Island fireworks from Rosewood Abu Dhabi, one of the most luxurious hotels in the capital. Choose from a unique dinner experience at AQUA with live stations and variety of packages to choose from, relish in Chinese cuisine favourites at DAI PAI DONG, overlooking the buzzing promenade , explore a Levantine feast with a twist at SAMBUSEK with live entertainment, or enjoy a front row view of the fireworks from your own private table at the most exciting Masquerade themed party of the night at GLO.